There may be several times over the course of your life as a homeowner when you may wonder how to tile a wall. From kitchen backsplashes to bathroom wainscoting, learning to tile a wall yourself can save you time and money. 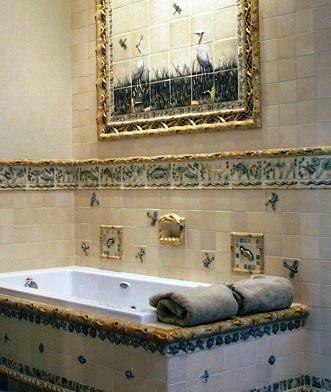 Gone are the days when ceramic wall tile was your only choice for a wall tile application. New adhesives and advances in tile technologies have expanded the field to include glass tiles, stone tiles and porcelain tiles up to 24-inches in size. When you select your tile for the job, make sure that you ask your sales person to recommend the best type of mortar for the job. You don't want to install a large format glass tile with mastic; you'll be looking at cracked tiles before too long. Nearly every tile dealer from Home Depot to specialty tile shops will also sell adhesives, trowels and grout, so pick up everything you need at once to ensure you've got the proper materials for the job. Before you begin to spread adhesive on the wall and slap some tiles up, you'll need to figure out where you want the tiles to go. If you are creating a pattern, such as a backsplash tile layout, you'll want to know ahead of time where your decorative tiles will go and how much space to leave. To accomplish this, you'll need to create a dry-layout. A dry-layout consists of laying out your tiles in an area of equal size to the space you're tiling, without mortar. This will help you figure out your pattern, cuts and grout joints. Start by measuring the wall you're planning on tiling and marking off an area of equal size on a flat surface. Begin laying out your tiles in this area to help figure out where they'll be placed on the wall. Lay your first tile in what will be the bottom, center of the wall and tile out and up in equal measures. This will give you a balanced installation. When you get to the sides and top of your wall, cut the tiles to fit on a tile saw. You can rent a saw from your local home improvement store. While you can cut tiles by hand, a tile saw is far easier and will save you a lot of time and effort. Once you've made all your cuts and you're comfortable with the pattern of tiles you've laid out, it's time to install the tiles on the wall. Start by spreading a small amount of mortar on the bottom center of the wall. Spread only a little mortar at a time to keep it from drying out too quickly. Comb the mortar with the notched side of your trowel until the ridges you produce are even in height. If you are installing glass tiles, smooth these ridges out again, otherwise leave them intact. Press each tile into the mortar firmly and twist it slightly into place. If you are installing a large tile 12-inches in size or larger, beat the tile into the wall with a wooden mallet to ensure it adheres well. Continue installing your tiles one by one in small areas of mortar until you've completed your wall. Allow the mortar to dry for 24 hours before you grout your installation to allow the moisture to escape through the grout joints. If you are installing a kitchen backsplash, run a bead of caulk between the tiles and the countertop. This will help absorb any movement and keep the tiles from cracking over time. Learning how to tile a wall may seem a daunting task at first, but if you take your time and use the proper setting materials, you'll be surprised at how easy it can be. Once you've tiled a wall, you'll be able to use your new skill to update the rooms of your home whenever you choose, saving you time and money while keeping your home looking great.